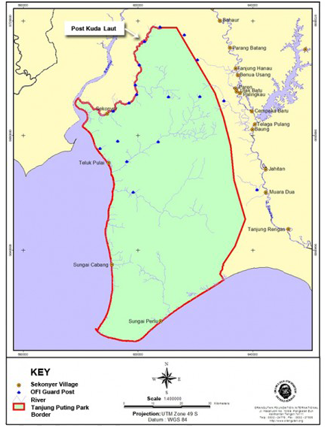 OFI funds active patrols of Tanjung Puting National Park. These patrols consist of Park rangers, OFI rangers, members of local communities, and police officers and/or OFI rangers with any combination of the above. These patrols represent a community-wide effort to keep illegal loggers and miners from degrading orangutan habitat in the Park. Since Tanjung Puting National Park contains the largest wild orangutan population in the world and large areas of peat swamp forest (representing an important carbon sink), this effort is of global significance. OFI provides help to the Park in terms of logistics and OFI rangers often accompany Park rangers on patrols initiated by the Park authorities. In addition, OFI has built 18 guard posts (see map on right) in and around the Park. OFI currently staffs 15 guard posts permanently with OFI rangers and 3 posts intermittently with rangers. The guard posts are frequently built on the mouths of small rivers to control access or in areas where local resource extraction has occurred in the past. OFI rangers patrol from the guard posts weekly, sometimes daily if necessary. The OFI-funded patrols and guard posts have been instrumental in helping the local Park authorities keep illegal activities out of the Park in recent years.